يشكل Sandancers Bed and Breakfast in Jervis Bay بموقعه الممتاز في جيرفيز باى نقطة انطلاق جيدة لاستكشاف هذه المدينة النابضة بالحياة. إن موقعه الجيد الذي يبعد 8km فقط عن مركز المدينة يساعد النزلاء على الاستمتاع بمعالم المدينة ونشاطاتها. يشكل هذا الفندق ملاذاَ مريحاً للاسترخاء ويمنح زواره فرصة للاستجمام والتجدد، وهو يقع على بعد خطوات من المعالم السياحية الكثيرة للمدينة كمثل: ‪Cape St George Lighthouse‬, ‪Jervis Bay National Park‬, ‪Booderee National Park‬. 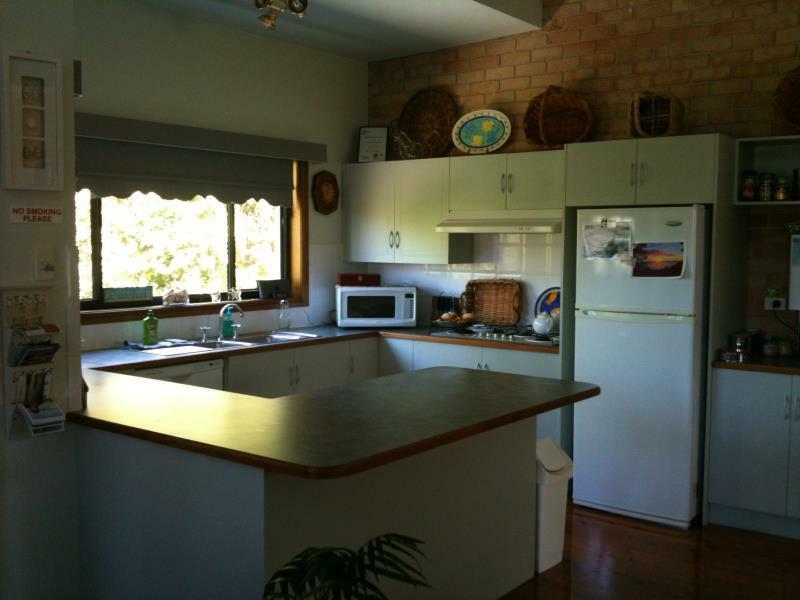 يعمل Sandancers Bed and Breakfast in Jervis Bay على ضمان إقامة مريحة لضيوفه من خلال خدماته الممتازة وحسن ضيافته. يمكن الاستمتاع بمجموعة من الخدمات على أعلى المستويات في الفندق كمثل واي فاي مجاني في جميع الغرف, خدمة التنظيف يوميًا, تسجيل وصول/تسجيل خروج خاص, تسجيل وصول/خروج سريع, تخزين الأمتعة. استمتع بوسائل الراحة الراقية في الغرف أثناء إقامتك هنا. بعض الغرف تتضمن اتصال لاسلكي بشبكة الإنترنت (مجاني), غرف لغير المدخنين, تدفئة, ساعة منبه, منصة آيبود لمساعدتك على استعادة طاقتك بعد يوم طويل. يقدم الفندق مجموعة واسعة من وسائل الراحة المتنوعة، كمثل: حديقة. 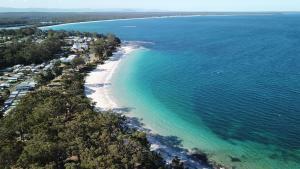 استمتع بخدمات لا يعلى عليها وعنوان ذو اعتبار في Sandancers Bed and Breakfast in Jervis Bay . Great location - just a few meters from the sea! Room was on the smaller side, but guests have the sole use of the large guest lounge. Various kinds of coffees and all kinds of tea are available all day long, and there are muffins in the afternoon. In addition, there is a deck with comfortable sofas and chairs where you can have a pre-or after dinner drink. Breakfast is great - lots of fresh fruit, yoghurt, cereals. Croissants and 3-4 kinds of bread, a wide range of spreads and jams as well as freshly brewed coffee. Tea-lovers can make their own tea and chose from at least 2 dozens of teas. The stay at sanddancers was awesome! Great value for money and location. Would highly recommend this. Lilian was very welcoming and ensured our stay was perfect. We had an amazing stay at Sanddancers. We felt very much at home in the warm and welcoming atmosphere. Absolutely recommend this B&B, super clean and nice little place with only 4 rooms. Impeccably clean. We really loved our 2 nights stay at Sandancers B&B. Highly recommended. Great accomodation, a little further from any resteraunt than anticipated but no problem if you have a car. Super sweet staff. Big breakfast. Clean and homey. 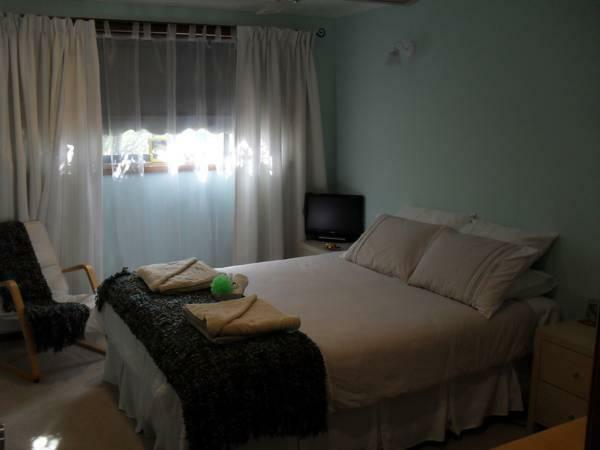 The rooms are of good size, clean and new, no coffee/tea making facilities in the room but available in the common kitchen. Toilet and shower are very clean. We love the luxurious continental breakfast and especially the fruit platter! Lilian the host is very lovely and very helpful. The living room is huge and very nicely decorated. The only problem we had was the noise from other guests. It's not that other guests are noisy but because the rooms are so close together and walls are thin, there's virtually no sound proof. You can hear others talking in the corridor and TV from other rooms. It does make us feel less "private" in our room which is a real pity coz everything else is so nice. Perfectly located in the Bay, close to Hyams beach, 15minutes drive from the National Parks, this B&B is clean, comfortable, pleasant and nicely decorated. There's wifi and a computer you can use if you need to find informatoons on the area. The living area is huge and comfy. Breakfast is huge. Lilian, the owner is very friendly and helpful and made us feel at home. We had a fantastic time and will definitely go back. Lillian was incredibly friendly and helpful, she clearly takes great pride in Sandancers and nothing is too much trouble. The rooms were clean and comfortable and the breakfast buffet was plentiful. Nära utmärkt stor strand. Mkt lugnt läge med veranda. Utmärkt engelsk frukost i mkt trevligt allrum Utmärkt för single gäst. Bra queen size bed, kan dock upplevas som alltför trång för två vuxna. Välstädat. Tips på besöksmål. Deze b&b is mooi en compleet. De gastvrouw woont op de eerste etage van de woning. Op de begane grond zijn de slaapkamers en de gemeenschappelijke ruimte en keuken. Wij waren de enige gasten en hadden de gemeenschappelijke ruimte voor onszelf. Erg luxe. Er is een laptop en internetaansluitng aanwezig. De woning is gelegen in een rustige wijk metgrote huizen. Op loopafstand ligt het prachtige Nelsons beach. In de ochtend wordt een uitgebreid ontbijt gepresenteerd met vers fruit. Это коттедж с комнатами. Все очень чисто и аккуратно. Тишина и покой в деревне. До Хайамс бич 4 км вдоль берега.